A strong end to the recent quarter allowed management to reaffirm full-year guidance, but other catalysts contributed to investor enthusiasm, too. 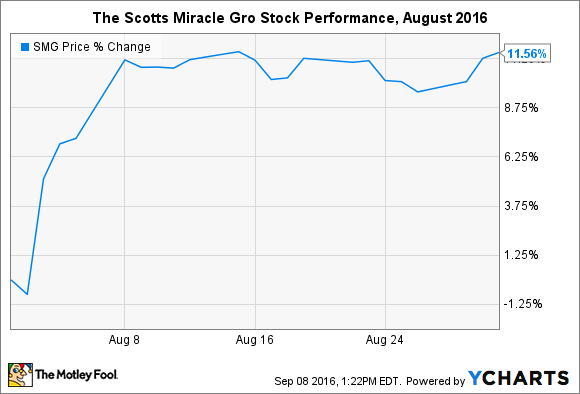 Shares of consumer lawn and garden products leader The Scotts Miracle-Gro Company (NYSE:SMG) leapt 11.5% last month after the company announced its fiscal third-quarter financial results. In fact, all of the stock's monthly gains came from that singular announcement at the beginning of August, which held throughout the month. The stock is now up 27% year to date. Compared to the same period in 2015, revenue in the most recent quarter actually dropped 10.5%, to $994 million. Most of the decline came from poor weather and the fact that the company shifted its fiscal calendar, which resulted in six fewer days during this year's second quarter. Gross margin for the quarter grew to 36% and GAAP (generally accepted accounting principles) operating income grew to $127 million, compared to 34.7% and $115 million, respectively, in the year-ago period. Those results may not sound like much to get excited about, but a 14% rise in consumer purchases in June signaled that Scotts Miracle-Gro ended the quarter on an upswing of momentum. That allowed management to reaffirm full-year guidance. As they say, it's not how you start, it's how you finish. Despite headwinds from weather and restructuring, Scotts Miracle-Gro has grown revenue 3% in the first nine months of its current fiscal year compared to the same period last year. Gross margin has improved, while operating income has grown a whopping 52%. More important for investors, management is enacting several cost-cutting measures to boost operational efficiency, and raised the dividend 6%. Scotts also acquired a stake in two companies to spur long-term growth. Scotts Miracle-Gro isn't going to blow the lid off with fast-paced growth -- hitting revenue guidance this fiscal year will represent just 11% sales growth from 2012 results -- but it is well positioned to capitalize on several long-term trends in home gardening and vegetable sales. Management's focus on acquisitions within the space could allow it to increase the pace of growth and better capitalize on the trends underpinning the industry.